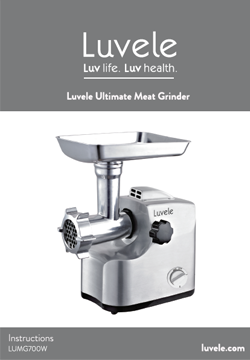 The Luvele Ultimate Meat Grinder combines superior performance with professional design features & premium metal gearing. With a new quieter 1800w (700w rated) pure copper motor, & sturdy die-cast aluminum body, it provides a balance of strength, flexibility & elegance. The unique 'Luvele designed' stainless steel sausage nozzles, feature the extra-large 32mm nozzle for extra-thick sausages, plus a 22mm and a 16mm nozzle. While the Luvele designed 'Smooth-Flow' sausage filling plate, allows for smoother sausage filling. The gearbox is designed with durable metal gearing, for added strength & longevity. While the Luvele 'Air-Flow Induction Cooling System', protects the motor from overheating.